Everyone has experienced strengths and weaknesses with their water skills. Dive masters and Instructors need to be able to not only do the PADI dive skill but show them to demonstration quality. 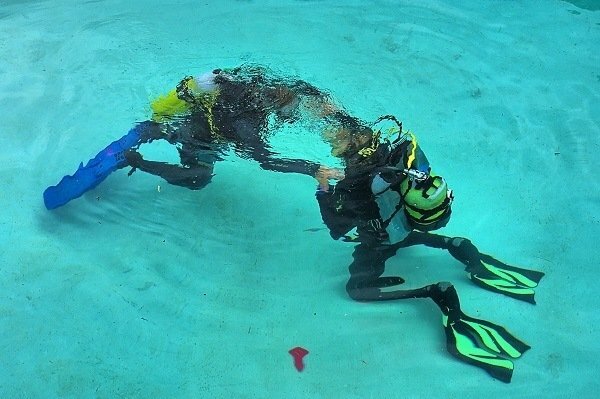 Whether you are a novice diver or an experienced dive instructor, here are some useful tips and tricks to getting those elusive perfect scores. When I am doing demonstrations I like to be significantly over weighted. But when you take off your weight belt sometimes you start to float around a bit. My cheat is to put only one small weight on my belt, and the rest go in my BCD. This way my BCD is weighing me down, and my belt is basically for demonstration purposes only. You can then show them not to hold the belt away from yourself and position it on your knee easily with no drifting. Once replaced, make a big show of adjusting the position of your belt and make sure your dump valve cords are not tucked into it. Sometimes I get a bit tangled up during the replacement part. To make this skill look easy I start by facing my students and loosening my straps. I plant the tank firmly on the bottom and show them to keep control with their right hand. The replacement part is where it gets harder. I kneel on my left leg and make a big show of putting my left arm in, turning to present my left side. I can then clearly show my left hand grabbing my tank as I bring it around. As I push my tank behind me, I turn slowly (changing to kneel on the right leg) to show my right side. This allows me to fix any snags as I turn, and make a big show of putting my right arm (chicken wing style) through the right hole. Then I can face them and do it up. Obviously ‘remember’ your console. I am very much over weighted in confined water, so the test for proper weighting is a challenge for me. What I do is leave just a little air in my BCD and take a really big breath instead of a normal one. I can then exhale a little to make myself float at eye level. No one has noticed yet. End by demonstrating a complete exhale to show that you will sink. While an experienced diver may not find this difficult it can make your students nervous. I always do this skill way too slowly, taking unnecessary time to adjust things and show the little bubbles as I exhale. This lets them see that they won’t die if they take a little while to find everything. You may wish to twist to show your right side (sit on your right knee) when grabbing for hoses to show clearly what your hand is doing. Always hold on to their waist band or shoulder with your left hand and be prepared to help them if they panic. Students, especially novices, can become a bit upset about water getting into their dive mask. With experienced divers I leave these skills until the end. During my demonstrations I take far more time than I need with my mask off. I show my water level, look around and play with my hair. Show them that you can still breathe. I always grab the BCD waist band of my students, with my left hand anytime masks or power inflators are involved. This leaves my right hand free to grab dump valves if anyone panics. Remember they need to do it for a set distance, but you don’t have to in your demonstration. I only swim a short distance right in front of the students and ‘Remember’ the required distance which allows me to go much more slowly and be seen more easily. I mime listening for the ‘aah’ sound when I'm most visible to the class. Your briefing and demonstration need to be especially slow as there is a lot going on. I like to tell my students that most people mess it up, and that I will be sincerely impressed if they get it right on the first try. Demonstrate everything a lot more slowly than you think. I like to take even more time than that and point out common mistakes to show students that there is no need to hurry. Your pre dive briefing should be short, because there is a lot of information to take in. Remember to let them know they can ask you to repeat demonstrations as many times as necessary, and that it is okay to make mistakes. Have you already mastered the Divemaster skills? Leave a good advices to the next Divemaster, in a Comment below! On the “remove/replace weight belt”. There is absolutely nothing wrong when you float a little once you remove your weights underwater. Secondly, as an instructor, when you still float while demonstrating this skill, you better practice more. On the “proper weighting”, how do you expect your students to do it when you yourself need to “cheat” to demonstrate the skill? “Big breath instead of a normal one”- this is wrong, man! As a dive pro, it is expected that you practice the skills to perfection, NOT “CHEAT”. Come on! Hi Valdimir, thanks for commenting and giving your opinion. You might be right that it’s wrong to “cheat” but if it makes your student preform easier and better, isn’t that the whole point. Regarding the floating as an instructor: I guess it depend on how your are build, we are all proportioned different some are bigger than others, and all of this effects our buoyancy. Some times when teaching I go down a bit overweighted, witch makes it a bit hard to preform a weight check without “cheating”. As log as the student learns the right technique. Well thats my opinion on the matter. I hope you enjoyed the article anyway. And again thanks for sharing your opinion, it’s nice discussing the matter! Our function as instructors is to help our students perform the skills correctly. If there are ‘tricks’ can use to achieve this more effectively, surely that’s a good thing. Being an instructor isn’t about being the best diver. It’s about creating safe, knowledgeable divers and giving people a great experience, whilst meeting all the course requirements. Well I guess it’s a matter of practice more than anything else. Choose the right place for your divemaster, where you can practice in the pool as much as you want. Know the skills through your backbone and you are golden. For student performance I would say it’s more in the briefing than the showing of the skill. Nope, I did not enjoy the article. It gives a wrong impression on the dive pros. Like I said, if you need to “cheat” to demo the skill, then it simply you can’t do it without cheating. Skill demo and briefing are entirely different but it complements one another. Both are important. One cant say that briefing is above skill demo or vice versa. Guys, just go to a pool and practice. It is in the Divemaster manual: no substitute for practice! Thanks I’m doing my final test in a few weeks. I’ll might use a few pointer to make it look good. I still need a bit practice too score all fives. Good luck We hope you pass with flying colors! I think this article needs an overhaul. Overweighted in confined water? Why ever would anybody want to do that? The only reason that comes to mind is that you want to be negatively buoyant. And lo and behold, the first picture of the article even shows divers kneeling on the bottom of the ocean (!) as if that were a habit that you want to teach your students. Even PADI has recognized that skills should be performed while neutrally buoyant 1) because that’s how they’re going to be applied in a real-life diving situation and 2) because it trains divers to remain aware of their buoyancy while doing other things – rather important for safety. The new OWD training standard even has an explicit no-kneeling rule, at last codifying teaching methods that the more progressive instructors out there have been using for years and years. Time to stop teaching like it’s 1985 – and if you can’t do your skill demos while neutrally buoyant as a DMT, then maybe you should ask your Open Water Diver instructor for a refund. Read you artical and all the comments which were just as helpful. Got my dive master mannel last week and started practicing my skilks demos in the pool yesterday. Slightly harder than I expected to get it perfect. Hi I’m about to start my dive master training , I found it an interesting read as at the moment I am like a sponge for any useful knowledge or information , but I was surprised to read about the fact you are having to take a really deep breath as you are over wieght education in fresh water . But on the whole I’m aware that people do have their own methods and approach and I’m lucky to a really great couple that are teaching me . Any tool we can use to help our studients should be used….otherwise….shame on us….be that weights or anything else!! !